BUENOS AIRES, Dec. 2, Chinese President Xi Jinping received Argentina's highest decoration, the Order of the Liberator General San Martin, from President Mauricio Macri here on Sunday. 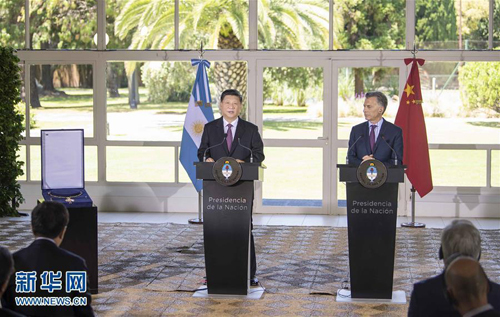 Addressing the ceremony at the presidential residence, Macri spoke highly of China's great development under the leadership of Xi, the relationship between Argentina and China, and the Asian country's important contribution to safeguarding world peace and promoting common development. Xi told Macri that he is honored to be awarded the decoration, as it symbolizes the Argentine people's national spirit of independence and carries the profound friendship between the Argentine and Chinese people. Xi said the honor does not belong to him alone, but also to all those committed to promoting China-Argentina friendship. The decoration, named after Argentina's national hero Jose de San Martin and granted by the head of state of Argentina, is the highest honor awarded to foreign nationals. The Chinese president arrived in Buenos Aires on Thursday to attend the Group of 20 summit and pay a state visit to Argentina.